The jacket of all jackets and the holy grail of the fashion world. A structured Alexander Mcqueen jacket fit for a queen with its angelic lace appearance and regal femininity. It's number one on my wish list found from a recent window shopping experience online. Alexander Mcqueen may have passed, but the reins have been pulled with Sarah Burton designing a beautiful optimistic future for fans to indulge. I may not be the queen, but i'm sure this jacket would bring out the inner queen in all of us. 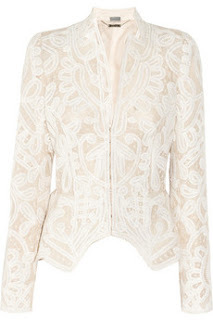 ALEXANDER MCQUEEN Crochet-embroidered silk-organza jacket, available at net-a-porter.